We’d love your help. Let us know what’s wrong with this preview of The Adversary by Julian May. To ask other readers questions about The Adversary, please sign up. A satisfactory conclusion to a really good tale. Many of my questions have been answered, although I think Ms. May has left herself some wiggle room to continue on at some future point, should she hear the Many Colored Land calling to her again. Las siete novelas que he leído suyas se agrupan en dos series. La de La Intervención (3 libros) y esta Saga del exilio en el Plioceno (4 libros). Autora poco conocida pero que se lee (o que leí) con auténtico frenesí. Recomiendo ambas, tal vez esta del Plioceno baja un poco en los dos últimos, pero ambas son joyas que tiene Ultramar en su colección de Grandes éxitos de Bolsillo (Ciencia Ficción). This whole series is awesome. I would love to see a movie, even an animated movie, of the many colored land and the galactic milieu. This review has been hidden because it contains spoilers. To view it, click here. ‘The Firvulag are rising, while the children of the metapsychic rebels race to reopen the time-gate, the sole escape route back into the Galactic Milieu. Now the adversary takes up his destined role in the power play… Marc Remillard, defeated leader of the metapsychic rebellion determined to keep the time-gate sealed and to create a new race from his own offspring. Will he aid the Firvulag or bring succour to Aiken, when the day of the Grand Tourney comes, when the Tanu and the humans meet the Fi ‘The Firvulag are rising, while the children of the metapsychic rebels race to reopen the time-gate, the sole escape route back into the Galactic Milieu. Aiken Drum is attempting to hold his kingdom together while the Firvulag are rising, convinced by ancient Duat prophecy that the Nightfall War is about to begin, the final battle to oblivion between the Tanu and the Firvulag. The central figure of the prophecy, The Adversary, is seen as Marc Remillard, who has sailed from his exile in Pliocene Florida back to Europe in order to prevent his children reopening the Time Gate and escaping back to the Twenty-Second Century. As a result of having nearly been killed by Felice when she teleported to America, Marc is slowly learning how to ‘D-Jump’ himself, and begins to appear to the Metapsychic Grandmaster Elizabeth Orme where he helps her to ‘cure’ the black-torc babies (i.e. babies who cannot adjust to the mind-enhancing torc). It transpires that a metapsychic programme is able to not only cure the children but raise them to metapsychic operancy. Once again, May manages to combine the fantasy settings with complete 22nd Century science quite seamlessly, and one has to ask how much she was influenced by the Science fantasy boom of the Seventies and writers such as Moorcock, M John Harrison and Jack Vance. There are certainly echoes of their work here. Where these writers often set their civilisations of decadent technology on a Far Future Earth, May takes us back to the Pliocene of six million years ago, but the trappings are the same. The Tanu and the Firvulag are, after all, merely elves and goblins, trolls and ogres with a technology so advanced it appears to be magic. Where May triumphs is in linking her world so directly to our near future and creating a structure in which the narrative returns to the future and, to a certain extent, comes full circle to where it began. The overall series deserves four stars, even though I've given the third and fourth book three stars. I enjoyed the continuity, the exquisite world-building, enhanced by the cool geological descriptions. The detail of the survival of the humans in the Pliocene and their various trades and specialties was also rendered more than believable. I sometimes felt I was there, with them, in the Pliocene Exile. However, the telepathic powers plot device overshadowed all of the good things, pushing my ove The overall series deserves four stars, even though I've given the third and fourth book three stars. I enjoyed the continuity, the exquisite world-building, enhanced by the cool geological descriptions. The detail of the survival of the humans in the Pliocene and their various trades and specialties was also rendered more than believable. I sometimes felt I was there, with them, in the Pliocene Exile. However, the telepathic powers plot device overshadowed all of the good things, pushing my overall enjoyment of the series down somewhat. I felt it got out of hand and would have liked a more 'mundane' solution to some of the problems between the different races: human, Tanu and Firvulag (including Howlers), and some conclusions about the mixed bloods influencing human evolution - that was never really satisfactorily explained (or I missed it). Many of my problems with the telepathic nature of the various antagonists and protagonists was that some things were just 'too easily' solved because of this. Character A has an insurmountable problem that Character B helps him/her solve using his/her superior telepathic (insert specific type of power here) skills. Sólo me ha costado UN AÑO terminarme el último de esta saga porque era del todo necesario escribir un PUTO LIBRO MÁS del asunto este. Y mira que el final ha sido bastante satisfactorio pero la paja hasta llegar ahí, dios mío, LA PAJA. El último y el penúltimo libro podrían haberse fusionado en uno y habría sido fantástico y no este chicle gastado y repartido por las suelas de todos los zapatos de Plioceno. Me enfada que los autores no sepan terminar sus sagas, pero me enfada todavía más que inten Sólo me ha costado UN AÑO terminarme el último de esta saga porque era del todo necesario escribir un PUTO LIBRO MÁS del asunto este. Y mira que el final ha sido bastante satisfactorio pero la paja hasta llegar ahí, dios mío, LA PAJA. El último y el penúltimo libro podrían haberse fusionado en uno y habría sido fantástico y no este chicle gastado y repartido por las suelas de todos los zapatos de Plioceno. Me enfada que los autores no sepan terminar sus sagas, pero me enfada todavía más que intenten muñir la vaca hasta el hartazgo. May tiene buenas ideas, pero no sabe narrar, no sabe mantener el ritmo y encima, vuelve OOC a sus personajes: Remillard y Aiken llevan 3 libros actuando como psicópatas, pero de repente son todo bondad y flower power. Y ese final con Elizabeth?? De la nada?? The conclusion of the saga. Felice has been zapped, but she seems to have d-jumped to fry Marc in the final milliseconds of her life. As Marc recovers he tries the obscure manoeuvre himself. Aiken faces and subsumes Mercy and then Nodonn, leaving himself in a vulnerable state as the grand tourney approaches and the Firvulag plan for Nightfall. Elizabeth tries to help but doesn't know what her destiny should be. A fantastic finale! I can't recommend this series enough, the writing is immense, cha The conclusion of the saga. Felice has been zapped, but she seems to have d-jumped to fry Marc in the final milliseconds of her life. As Marc recovers he tries the obscure manoeuvre himself. Aiken faces and subsumes Mercy and then Nodonn, leaving himself in a vulnerable state as the grand tourney approaches and the Firvulag plan for Nightfall. Elizabeth tries to help but doesn't know what her destiny should be. A fantastic finale! I can't recommend this series enough, the writing is immense, characters are great and visualisations amazing. Great end to a fantastic series. The last part of the book felt slightly rushed, but all individual storlines concluded. For any fantasy/sci-fi lover, the Saga of Pliocene Exile is a recommended read. I fell for it long long time ago, and still do. Each installment just keeps getting better. It's good, but not as good as the rest of the series. The weakest of the four books, but still enjoyable enough. I guess I just don't like Marc's character as much as most of the others. A satisfying ending to the best space opera I've ever read. This review has been hidden because it contains spoilers. To view it, click here. Don’t read this review until you have read the previous books of the series, THE MANY-COLORED LAND, THE GOLDEN TORC, and THE NONBORN KING, as background. King Aiken-Lugonn has been severely injured in his most recent battle for rulership of the Tanu kingdom in Pliocene Europe. He is barely able to use the stupendous mental powers which won him his throne. But the world is not going to stop and give him time to recover. The oldest people among the Tanu and Firvulag who colonized Earth have seen th Don’t read this review until you have read the previous books of the series, THE MANY-COLORED LAND, THE GOLDEN TORC, and THE NONBORN KING, as background. King Aiken-Lugonn has been severely injured in his most recent battle for rulership of the Tanu kingdom in Pliocene Europe. He is barely able to use the stupendous mental powers which won him his throne. But the world is not going to stop and give him time to recover. The oldest people among the Tanu and Firvulag who colonized Earth have seen the omens, and they are convinced that the time for the Nightfall War has come. If any one of Aiken’s four groups of opponents sense that he is bluffing, the Tanu kingdom will shatter. Fortunately, Aiken is very good at bluffing. 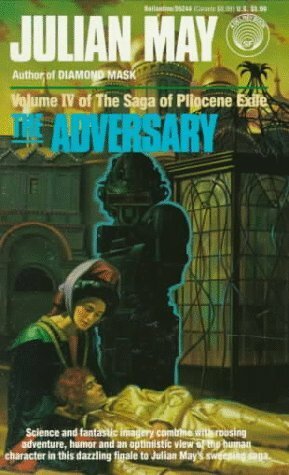 THE ADVERSARY follows the interwoven relationships of people from each of the five groups, plus the reluctant arbiter of them all, Elizabeth Orme. Elizabeth supports the aims of King Aiken and his Tanu, Howler, and human followers. Aiken, with his enlightened despotism, seems the best ruler available. Certainly not King Sharn-Mes of the Firvulag, who plans to exterminate all Tanu and humans. Certainly not Marc Remillard, whose cold, cruel mind is the only one stronger than Aiken’s. The other groups have no ambition to rule. The Lowlives, outlaw humans, cooperate with Aiken when they feel like it. The children of Marc Remillard and his followers want only to build a time gate to take them to Earth’s twenty-second century A.D., where their parents came from. The maneuvering to build the time gate is the main plot of THE ADVERSARY. The title character, the Adversary himself, is Marc Remillard. His driving urge is the urge for dominance: humans over other species, himself over humans, his descendants mutated into forms which will allow them to dominate their universe. But Marc’s methods thus far have been so draconic that his children find them – and him – repugnant. One of his son Hagan’s goals in returning to Elder Earth and the government of the Galactic Milieu is to help the Milieu find and destroy his father. So when Marc starts visiting Elizabeth and helping her heal children, all anyone can think of is the terrifying power Marc is developing: learning to jump instantaneously anywhere in the universe, carrying along anything he chooses to bring. Everyone knows that soon Marc will be able to stop the building of the time gate. For the reader, a single triangle dominates THE ADVERSARY, in spite of its many interesting subplots. The characters of Aiken, Marc, and Elizabeth are so strong as to overwhelm all other interests. We learn to know each of them deeply as they evolve to meet their ordeals. There is a fascination to these three powerful minds, each with their own fetters in spite of their far-ranging strengths. What do they really want? What do they love? What will touch off the inevitable explosion? Which way will the balances tip? The genre of “complicated science fiction series” has growing numbers of fans. Keeping track of numerous plots using invented skills in an unfamiliar setting is a satisfying challenge for people who like to reach farther than the lives of everyday Earth. Author Julian May weaves complications with the best of them. The characters of The Saga of Pliocene Exile touch archetypes from our subconscious, making us believe that everything she writes of is possible. They live out their aspirations or lack of them, connive and betray, heal and protect, love and hate. They even, sometimes, do all these at once, just as we might do. Originally published on my blog here in October 1998. In the final book of the Saga of the Exiles series, the rebel metapsychic Marc Remeillard plays a large part; the title of the novel itself is one of his nicknames. His children, and the others of their generation, inhabiting the small settlement set up by the rebels, have gone to Europe, with the intention of setting up a copy of the time gate at the Pleistocene end so that they can return to the future. They were too young to have been invol Originally published on my blog here in October 1998. In the final book of the Saga of the Exiles series, the rebel metapsychic Marc Remeillard plays a large part; the title of the novel itself is one of his nicknames. His children, and the others of their generation, inhabiting the small settlement set up by the rebels, have gone to Europe, with the intention of setting up a copy of the time gate at the Pleistocene end so that they can return to the future. They were too young to have been involved in the rebellion, and hope for acceptance by the Concilium which rules the human polity. Marc, however, has his own plans for them The roots of his disagreement with the Concilium were his plans for Mental Man, an entity purely of the mind. He wanted to accelerate human evolution to achieve this, using his own genes as a basis (as a member of the strongest human family of metapsychics, with a unique gene giving self-rejuvenation, he was a not unreasonable choice). But the death of his wife in the fighting occasioned by his refusal to accept the Concilium decision to discontinue his research led to a psychological infertility (his germ plasm no longer appeared to be fertile). Thus his plans relied on the availability of germ plasm from his children, hence his determination not to let them travel six million years into the future. He has been unable to bring himself to tell them, partly because he doesn't know what he would do in case of refusal, and partly because he hopes he himself might recover. The scope of this saga spanning eight novels is staggering. A gate is opened to the past, specifically the Pliocene era. But it is a one-way trip. Adventurous souls travel back, and find a world unlike any they could imagine. Epic conflict rages between ancient races, and the future destiny of man is decided. The initial four books make up The Saga of Pliocene Exile. These can be read as a standalone series, but who wou The scope of this saga spanning eight novels is staggering. A gate is opened to the past, specifically the Pliocene era. But it is a one-way trip. Adventurous souls travel back, and find a world unlike any they could imagine. Epic conflict rages between ancient races, and the future destiny of man is decided. The initial four books make up The Saga of Pliocene Exile. These can be read as a standalone series, but who would want to stop there? The “bridge” book deals with first contact and the emergence of humans with “supernatural” powers such as telekinesis. * Intervention. In the US edition this was divided into “Intervention: Surveillance” and “Intervention: Metaconcert”. The Galactic Milieu Trilogy deals with events after humanity has entered the galactic community. What surprised me as I finally finished the whole thing was how May had meticulously planned the entire arc from the very beginning, with elements important to the last novels referenced in the first. This lends the whole series a sense of completion rare in such works. Considering the fact that it took over 12 years to write, the achievement is even more impressive. The characters are amazing, with rich depths and particular quirks that blend in well with the evolving destiny of humankind. The settings, especially in Exiles are fabulous. Unfortunately, the US covers are beyond awful, but don’t be put off by that. Also unfortunately, the books are out of print, but can be easily found second hand. Yum....finished a long time favorite! This series has the distinction of making every subsequent volume worse than the one before. Despite having 1,748 pages in which to develop the Pliocene, I never felt that I got to know the Many-Colored Land. We were immersed in politics and war, distracted with minor romances and side-quests, and pelted with PK technobabble, Latin and French, but the only feeling I got for the land was that the mountains were taller and the fauna more saurian. I don't think the book would have been all that different were it to have taken place in the Galactic Milieu or in Duat. I have re-read these for the first time in 20 years and am still in love with them. Now I know where those half-remembered characters that have haunted me for years came from. May is a brilliant story spinner and devotes her entire talent to dialogue and tension, while the action seems to take a second place. At times May uses a very few words to leave a blistering image in your mind for all time. Be prepared re-read some passages many times to pick out all the detail and implications. Marc's att I have re-read these for the first time in 20 years and am still in love with them. Now I know where those half-remembered characters that have haunted me for years came from. We don't need sterile totalities dribbled into our brains with nothing left for us to do but watch, or flat bland worlds with no detail. We need our minds to be exercised for us so that we can cope with, and explore, elaborate, well delivered punches from masters like May. I enjoyed this book, and thought the Pliocene Series was wonderful overall, but I definitely thought this book was the weakest of the four. In addition to losing so many interesting characters, I really wanted the book to end a different way. In fact, I had the ending I wanted to read all worked out in my head half-way through the second book (The Golden Torc), based on something early on in the first book (The Many-Coloured Land). KIND O I enjoyed this book, and thought the Pliocene Series was wonderful overall, but I definitely thought this book was the weakest of the four. In addition to losing so many interesting characters, I really wanted the book to end a different way. In fact, I had the ending I wanted to read all worked out in my head half-way through the second book (The Golden Torc), based on something early on in the first book (The Many-Coloured Land). Julian May is a genius. A genius with words: every other page has me reaching for a dictionary. Caracoles, anyone? Taboret? Gimcrack? Breechclout? What education produced such a voluminous vocabulary? A genius at world-building. I gave up on the first book in the series after some flowery medieval-sounding language that sounded a little too "fantasy" for me (I've always thought myself the hard sci-fi fan) and yet here I am a couple of months after picking it up again in desperation, just finished Julian May is a genius. A genius at world-building. I gave up on the first book in the series after some flowery medieval-sounding language that sounded a little too "fantasy" for me (I've always thought myself the hard sci-fi fan) and yet here I am a couple of months after picking it up again in desperation, just finished with the fourth and final volume. What finally sucked me in but the enormously complex cast of characters in a universe so alive with detail that it seemed to exist outside of the pages? story but rather than killing her left her in sort of limbo. There was also this subplot about two infants that apparently were destined to do something but never did. These were dwelled on in book 3 at considerable length but never mentioned at all in book 4. The author may have been trying to tie this series into another. If so, the connection was not obvious and I never read it. The series' epic conclusion, everything takes on a grander scale. Characters enjoy more power, and near their goals. I was left with questions, intentionally I believe, that make me want to continue to the sub-series that prequels this one. My favorite part of this book, and the series to be honest, is the characters. May's genius seems most apparent in the plot and the fantastic science fictional ideas, but as the series progressed I found myself loving the diversity among and within the charact The series' epic conclusion, everything takes on a grander scale. Characters enjoy more power, and near their goals. I was left with questions, intentionally I believe, that make me want to continue to the sub-series that prequels this one. A rollicking good read with a variety of writing styles, fantastic creations, and a plot that has been crafted, researched, thought about. Julian May was an American science fiction, fantasy, horror, science and children's writer who also used several pseudonyms including Ian Thorne, Lee N. Falconer and many others.